I don’t really like doing puzzles. That’s a nice way to say, “I hate doing puzzles.” Especially the 3000 piece doozies of say, a lush forest. Just a lot of trees, maybe with dew on their leaves. Oh, and the sun shining through the branches. Oooooh la la. No. I would rather just go walk outside and look at a whole forest, instead of forcing together all these minuscule green and brown look-alike cardboard pieces of trees. And more trees. 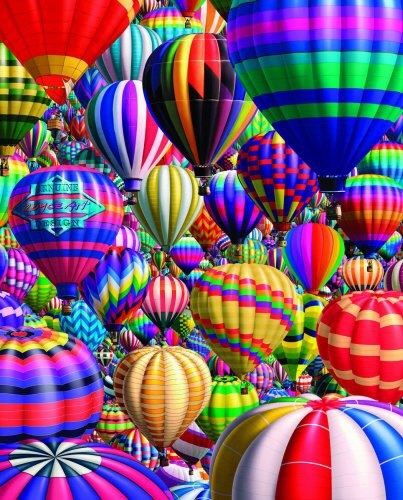 The hot air balloon puzzles are pretty spectacular, I know, they have differing bright colors. I just say no to those guys too. I used to nearly go crazy trying to put all of my kids’ puzzles together at the end of the day. You know, to get organized. So, they could dump them all out first thing in the morning. I know it is good exercise for kids’ brains to build, do puzzles, smart thinking stuff. They just take me a looooong time to complete. If I ever do complete them. I have found that drinking beer or wine actually does not help my brain kick into “puzzle mode.” Come to think of it, I may be missing whatever part of the brain it is that specializes in completing puzzles. It may be the same part that helps you play a guitar. Maybe it’s in there, just really weak. It’s going to stay atrophied, virtually non-existent. I’m not about to go strengthening it, if that entails doing a bazillion puzzle push-ups. No, thanks. If you locked me in a room and told me that my life depended on me completing a 500 piece puzzle, I may just start eating the puzzle pieces to choke myself. Put myself out of my own misery. Or something. Because I’m going to fail. And I would rather choke than get uber frustrated in my final moments trying to jab and bend pieces to fit into a space that wasn’t intended for them. I also know how to use the chair to perform the Heimlich if I changed my mind. Choking on puzzle pieces sounds pretty awful. I guess I’ve always been good at exaggerating. Despite my disdain for puzzles, they make great analogies for life. I often feel like a human puzzle piece. You might know the one I’m talking about. That one that looks like it could fit into the corner over there or into the middle of that weird lizard puzzle. Or look, it’s going to kind of work in the puzzle of the world too. I’m not sure if everyone feels this way. Like you have all these different groups of people who you’re trying to fit into. All of the time. Your family, old friends, work friends, mom friends, neighbor friends, your husband’s friends, new friends, church friends, even Facebook friends. Groups. Groups. And more groups. I guess it’s a good problem to have. Maybe. But it’s a hell of a lot of puzzles to be fitting into. Sometimes, I forget which puzzle I am even in. I look around. Ack. All of the pieces look the same. How I am supposed to act, what is my role in this puzzle. Oh, don’t be so honest in this puzzle or so loud. Or inappropriate. Just simmer down. Be a tree. Okay. Wait. I would rather go find another puzzle. To try to fit into. Where I can be jagged, that weird heart shape, whatever. I just don’t want to cram myself in and be uncomfortable if I don’t have to. I think as I get older, I feel less and less pressure to jab and bend and not fit into certain puzzles. I am a thrift store puzzle of sorts. Maybe you live with yourself long enough to realize that it’s not worth the struggle. I sadly meet young kids, ten to twelve-year olds, all of the time, that tell me they have no friends at school. One even asked me this weekend, “will you be my best friend?” It’s rather heartbreaking. Every Time. Of course I will be your best friend for the next two hours or so. How sad that a spunky little twelve-year-old has to ask a newly met 35-year-old to be her best friend. In the hospital. A lot of times, I want to pep-talk these sweet souls about how kids and grown-ups alike can be flat-out insecure. And take it out on you. Or just be cruel, mean and unfair. Bitter and unhappy. For no damn reason at all. Or maybe for a lot of reasons, that have nothing to do with you. Hang in there. People may or may not get better, but you will grow stronger in who you are. Put on your headphones and turn your music up. Loud. They may not like you, but seriously, why would you want a person that acts that way and treats people that way to like you? Case and point. A coworker saw me after I helped with a procedure and said in a snarky, condescending tone, “are you just the happy train?” Wow. How to reply to that one. Yep. I have a Bachelors in being the happy train. If you only knew about the next room I was going into. There were so many responses, yet so little time. Not that the doctor cared how or what my response would be. So, “Yep, I am the happy train and I will gladly give you a free ride tonight. Seems like you could use one.” Unfortunately, I had to roll my “happy train” into that awful next room. And no, I’m not always a happy train. But, at work, I will do just about anything to help kids feel a little better, a little happier, a little more loved on. A little less like a puzzle that’s missing so many pieces. Wow, I never thought of the puzzle analogy before, but I have felt like this so many times. And some “puzzles” are easier than others. It feels really nice to know that I am not the only one. It is sad that someone would even talk like that at your work, but it makes me SO happy thinking of you helping kids feel a little happier and loved on. Thanks for this post, Amelia. I’ve used the puzzle analogy before. I like to think of it like this. I get random puzzle pieces at different times of my life. Some pretty and bright, some dark. But God has the outside of the puzzle box and He knows that all the pieces He gives me will fit. I just need to look to Him for direction. I like it, Amy. Thanks!